Earn $7.49 in Rewards credit (749 points) What's This? Carve your line like a hot knife through butter. 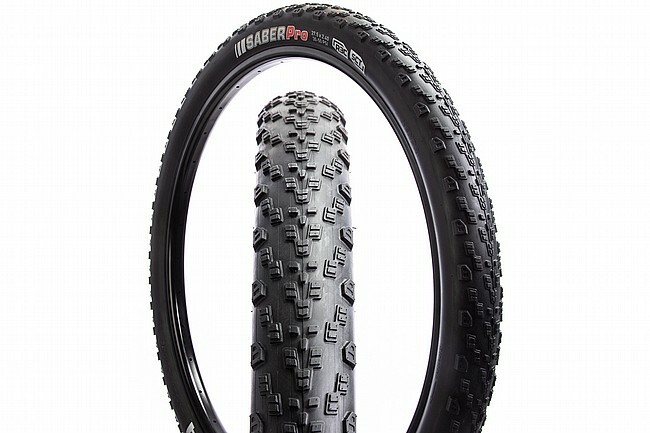 The Kenda Saber Pro MTB Tire is the first in a new generation of cross country tires from Kenda. Designed to be the fastest and lightest cross country tire on the market. The heart of this new race bred tire is the R3C rubber compound which allows for very low rolling resistance , amazing grip, and a lightweight low profile tread design. The Saber Pro has a high volume casing to absorb the course while a low uniform tread profile offers minimal rolling resistance. With edge knobs that are larger and hooked to give you maximum traction in the corners, the Saber Pro is designed to do one thing, win races! Versatile, durable cross-country tire designed for fast rolling and optimal grip. R3C rubber compound is Kenda's fastest compound, providing significantly lower rolling resistance and increased wet weather grip. Available in three widths: 2.2", 2.4", and 2.6". Claimed weight: 645g (2.2"), 621g (2.4"), and 700g (2.6"). Great tire for multi-surface riding!